Last week’s meeting in Luhacovice, Czech Republic was a great success, with both very productive meetings and a chance for the team members to catch up on important issues during this face-to-face time. In addition to the meetings, the group was able to enjoy different aspects of the local culture, including the cuisine, the architecture and especially the spa, which makes Luhacovice and its surroundings one of the most important health and well-being destinations in the country. The term „spa“ in the Czech Republic can be very different from how it is understood in some other countries. In Luhacovice, for example, the mineral springs are the main natural resource that give this town its official status as a „spa town.“ Though the water is used for various procedures, there are no public spa houses where people go to bathe collectively in the water. 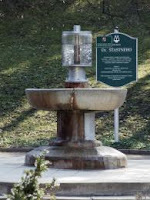 Instead, the springs are found flowing from special fountains and also in gazebos and colonades built to protect them and to allow visitors to sip the water while walking the trails in surrounding parks and forests. The heavy mineral content of the water (6-8° C) can give it a very unpleasant taste! However, one should keep in mind that it is drunk not for the flavor, but for the health benefits! The water here, which should taken on an empty stomach and in very small amounts, is known to have a positive effect especially on respiratory problems and digestive problems, but many other ailments are also treated with the mineral spring water . Each of the 17 springs has a different mineral content and depending on a spa patient‘s condition, spa doctors prescribe a particular spring, how much should be drunk and when.